While native to Asia, you can grow kiwi fruits in your own backyard. Hardy kiwi will grow in the US as far north as into zone 4. Actinidia arguta 'Ananasnaja' is the female kiwi vine that will mate with the Hardy Male for fruit production. Plan to grow your kiwi plants on strong trellis cables or fencing. Space plants approximately 10 feet apart. One Hardy Male kiwi plant will pollinate up to 9 female plants. Kiwi plants reach maturity and begin flowering in their 4th to 5th year. Flowers appear in early spring with fruit maturing in fall. The fruit will have green skin that will mature to purple red in sun. Begin fertilize applications on your vines in early spring of the second year. Prune away stems that fruited the previous year back to about 1 to 1.5 feet. This Kiwi fruit variety is a bit larger grapes, not fuzzy and can be eaten right off the vine without peeling. Also, called kiwi berry, baby kiwi and grape kiwi. These mini kiwis have a wonderfully sweet flavor, can be dried and made into wine. Actinidia arguta are higher in vitamin C than most citrus fruits. 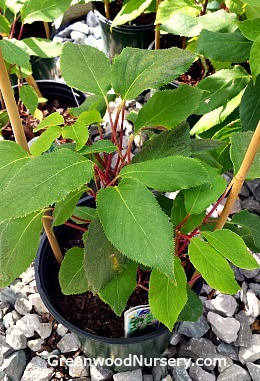 For detailed information on planting and growing kiwi plants in your garden, visit http://fruit.cornell.edu/mfruit/kiwifruit.html and https://extension.psu.edu/hardy-kiwi-in-the-home-fruit-planting. This item does not ship to CA, AZ, HI.